The town of Omertà has never been what you'd call “sleepy.” There’s always been the occasional murder and a secretive but infamous criminal element. Recently, though, someone is found dead almost every morning: an ambitious young reporter who asked too many questions, an overnight nurse at the hospital who’d saved countless lives, the district judge known for his upstanding character, even a stay-at-home mom who managed to keep her mob connections completely hidden from family and friends. The Mafia isn’t just out for blood right now, they’re seeking revenge. 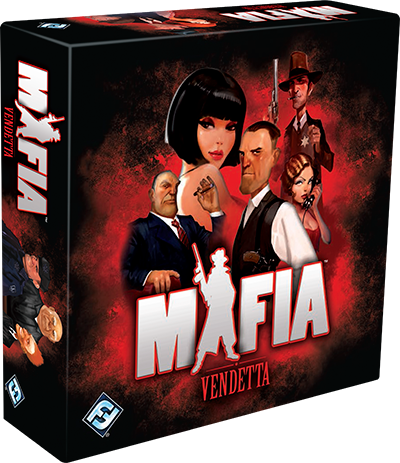 Mafia: Vendetta, the party game of secret roles developed by the team at Hobby World, is now available in English for the first time at local United States retailers and in our online store. Let your party’s crime drama begin! Based on Dimitry Davidoff’s now-legendary original design, Mafia: Vendetta casts players randomly as either ruthless mobsters or innocent civilians. Every night, the Mafia secretly assembles and takes out one of their enemies. Every day, all of Omertà gathers to discuss the night’s events and condemn a suspected murderer to death. How you win depends on your role. The civilians want to eliminate the Mafia; the Mafia wants to kill enough civilians to dominate the town. A few select civilians and Mafia members have actions in addition to selecting nightly victims and voting for daily suspects. On the Mafia side, there are four mobsters who can do more than the average Thug. 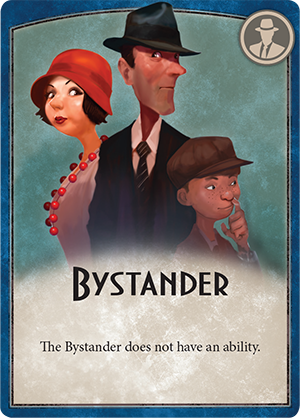 The Thief can prevent another player from acting during the night, while the Godfather can keep a player from voting to condemn a suspect during a daytime civilian discussion. The Mafia’s Lawyer can investigate another player to learn that player’s real identity. 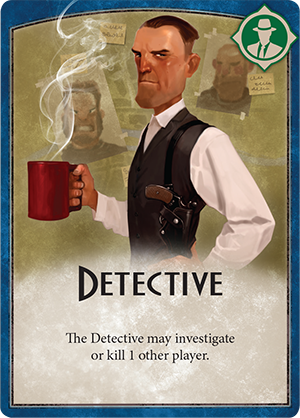 The Snitch spreads false information, badmouthing a player so that if that player is investigated, the investigator is shown a Thug card no matter what that player’s true character may be. Working diligently on behalf of Omertà’s innocent bystanders are civilian leaders and specialists with their own unique abilities. 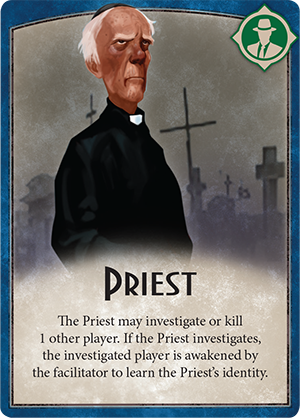 Several of them, including the Detective, Judge, Jailer, and Priest, can investigate a player. If the Jailer discovers through his investigation that he’s found a Mafia member, he can jail him, preventing that player from voting to kill someone or using any other ability. The Priest runs a risk in his investigations: whoever he investigates sees him and learns his identity as well. 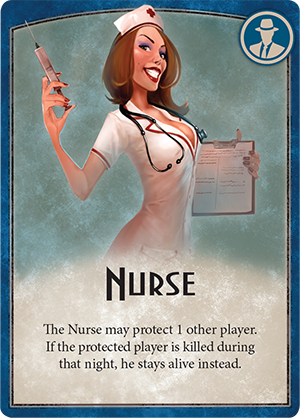 The Nurse may not be able to investigate anyone, but she can protect a player of her choice from being killed in the night. She just has to be careful to protect the right person. 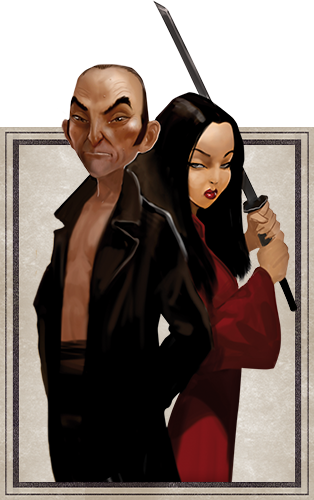 There may even be a third faction involved in the game: Mafia: Vendetta features Yakuza mode, in which another organized crime group competes with the Mafia for power; and the Loner mode, in which an individual works to undermine all the major players of Omertà. That Loner could be the beautiful and bloodthirsty Femme Fatale, who kills off all but the most innocent, one by one. It could also be the playful Imposter, who pretends to be a Thug and sabotages the Mafia’s crimes from within. Or it could be the Psycho, who simply kills indiscriminately for his own amusement. Every round of Mafia: Vendetta has a night and a day. At night, the Mafia and other criminals silently do their dirty work. During the day, everyone in the community, civilians and Mafia members alike, gathers to discuss the recent murders, point fingers, and deal out the death penalty. This discussion is the heart of Mafia: Vendetta. It’s the only chance players have to share knowledge, incriminate each other, and argue their own innocence. What happens during this discussion doesn’t just determine who may be condemned to death, it affects who will be killed, investigated, or protected during the next night. Unless you’re an innocent bystander, this discussion is also a time for you to lie as well as you possibly can in order to stay alive. As a Mafia member, you need the civilians to believe that you’re one of them. Ideally, you’ll convince the innocent bystanders that you’re the Detective, Judge, or other leader who knows the truth about others’ identities. That way, you can get the civilians to kill each other off, helping you to win the game. The same goes for the Loners and the Yakuza, who can only reach their goals if they blend in as much as possible. If you’re a civilian leader or specialist, you’ll use what you hear during this discussion to decide your next secret move. If you’ve performed any investigations, you also need to communicate what you know to other civilians, but don’t do it openly. If the Mafia learns during the day’s discussion that you have an ability you can use against them, they’re sure to select you as their murder victim that night. Given players’ individual personalities and Mafia: Vendetta’s nineteen secret roles, it’s impossible to inhabit the same crime-ridden community twice. The game offers twenty-three different setups for anywhere between six to sixteen players, not counting the all-important facilitator. 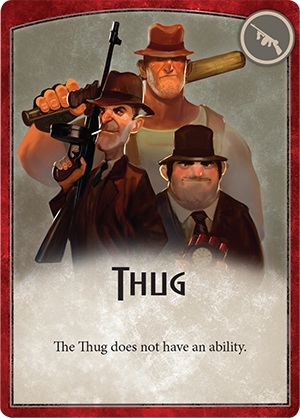 Those suggested setups don’t specify which mobsters, loners, leaders or specialists you may choose, so several combinations of roles are possible even with a smaller player count. 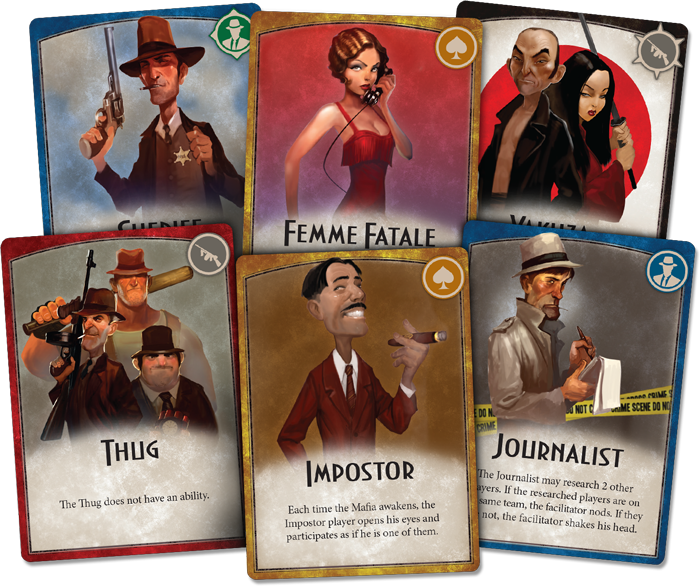 Of course, as you become comfortable playing and facilitating the game, you’ll discover your favorite combinations and develop your own house rules for maximum drama in this crime-themed game. Whether you’re a criminal or civilian, Godfather or Nurse, ambitious Yakuza member or deceitful Imposter, you have a say in the future of Omertà. Become involved in your community; pick up your copy of Mafia: Vendetta today! 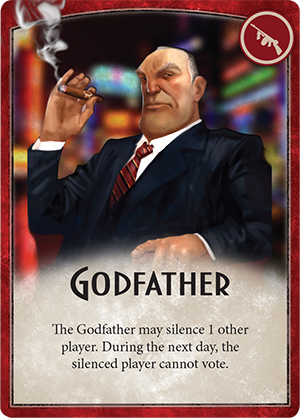 Mafia: Vendetta is a party game of bluffing and suspicion for seven to seventeen players. Living in your town are ruthless Mafia members who pretend to be innocent civilians by day and commit murders every night. The civilians must discover the identity of the Mafia members and condemn them all to death, but if they fail the Mafia will forever dominate the town. Play your role well, trust no one, and take out your enemies in order to win!